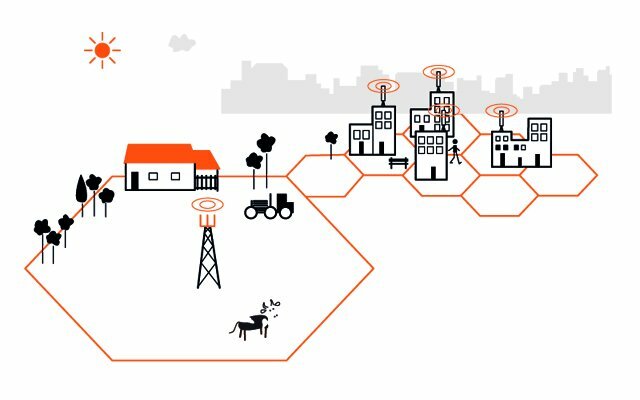 how does a mobile network work? Mobile communications follow the general principle of telephony: connecting two remote users through the network equipment of an operator responsible for managing the service. But unlike fixed phones, in the mobile network, it is not copper wires or fibre optics but radio transmissions that provide the final link. A user’s mobile telephone communicates through the air with an base station antenna, which in turn links to the central exchange of the operator – a computer. This routes the communication to the corresponding party on the fixed network or via other base stations. To communicate, a mobile user must be within range of base stations. This has a limited range, and covers only a small area around it called the “cell” (hence the alternative name of “cellular networks” often used for mobile networks). To cover maximum territory, and ensure that users are always able to call, operators deploy thousands of cells, each equipped with antennas, ensuring that their cells overlap and thus never lose the current location of the users. Cell size depends on many factors such as the type of base stations used, terrain (plains, mountains, valleys, and so on), location of installation (rural or urban areas), and population density. Cell size is also limited by the range of the mobile phone, which must be able to make the return link. And, importantly, base stations have a limited transmission capacity, and can only handle a certain number of simultaneous calls. This is the reason why, in urban areas, where the population density is high and there is a significant number of communications, cells tend to be numerous and small – hundreds or even only tens of metres apart. In rural areas, where the population density is much lower, the cell size is much larger, sometimes up to several kilometres but rarely exceeding more than ten kilometres. It is important to emphasise that reducing the power of the signal emitted by base stations in turn reduces the coverage of the cells. Improving the network’s ability to carry voice calls or data traffic thus necessarily involves increasing the number of base stations.